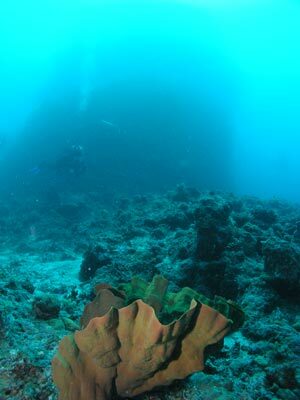 One of the dives on the Ribbon Reefs that is sometimes done at the start of an Undersea Explorer dive trip is Pixies Pinnacles. This is located 173 kilometres north-north-east of Port Douglas. This site is only 275 metres south-west of Pixies Gardens, another site you will most probably do on the first day. If you do not do on the first day, it is likely that you will do on the way back from the Cod Hole. The GPS Reading for this site is S14° 55' 47.7" W145° 40' 32.1" using WGS84 as the datum. Please read my GPS Page from the left menu for more information about GPS and datums. There is a mooring located here off the north-eastern side of the pinnacle. 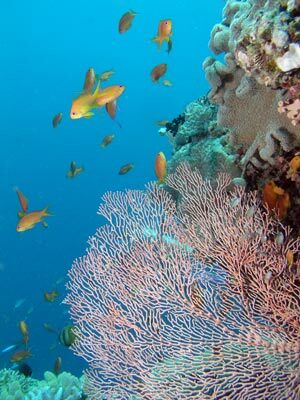 As the site name suggests, this dive location is a pinnacle that rises up from the bottom to within about five metres of the surface. The pinnacle is perhaps 20 metres by 20 metres on the top and has a shear drop to at least 17 metres before it slopes away further to about 28 metres. See later for a more detailed description of the bottom. 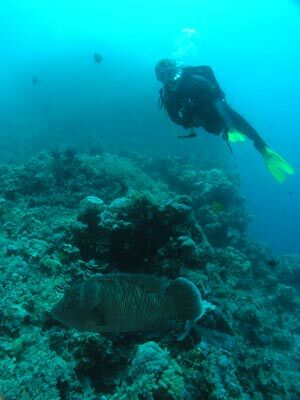 The sandy bottom away from the pinnacle is about 28 to 30 metres and may be deeper (you will not dive this area). Once you have moored, you will normally drop into the water and swim towards the pinncle at an angle. When you reach the pinnacle, you either swim in a clockwise or anti-clockwise direction and on each circumnavigation, you ascend a few metres. 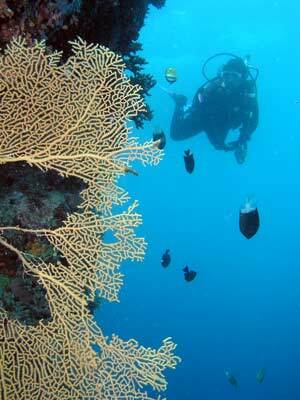 It is not unusual to go around the pinnacle about five or six times on the dive. The bottom of the pinnacle is probably 30 metres across. On the north-eastern side it is about 17 metres deep and on the southern side it is 20 metres deep. On the southern, western and eastern side it slopes to the sandy bottom at 28 metres. On the northern side there is a saddle that runs out a fair bit and this slopes down much more slowly. The northern and north-western sides have the most attractive growth. There are a lot of large gorgonias in this area and they can make a very nice photograph. The fishlife on the day I dived here was more concentrated on the north-eastern side. 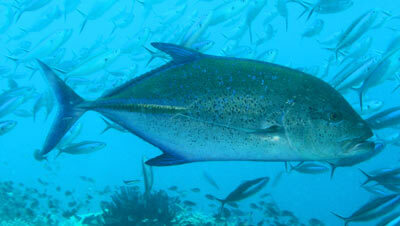 There were large schools of barracuda, giant trevally, blue-finned trevally and more. 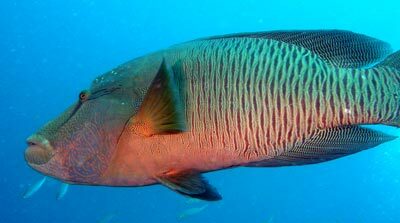 We also saw a couple of very large maori wrasse. As you ascend, you will see some nooks and crannies in the wall of the pinnacle. Check these out as you may find things like pipefish, sea spiders and anemones. The anemones have clownfish of different species and one had a very strange looking crab/spider type animal that I had great difficulty getting a photograph of. The top of the pinnacle is also very interesting and you should do your saftey stop here before heading back to the boat. Visibility here on the day I dived was at least 20 metres and the water temperature 26°C in October. A very nice dive site.